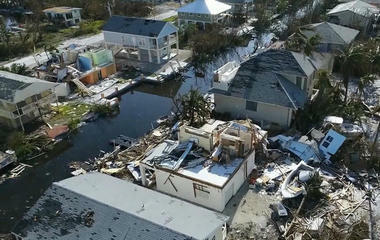 Homeowners rebuilding after hurricanes in Florida and Texas and wildfires in California will face longer wait times and higher costs as a long-simmering shortage of construction workers nears a crisis stage. The number of unfilled construction jobs has reached its highest point since 2007, before the Great Recession, and it's likely to spike even higher in the months ahead in the wake of hurricanes Harvey and Irma, said Robert Dietz, chief economist for the National Association of Home Builders. There were 247,000 open construction jobs in August, up 34 percent from the same month in 2016, according to an NAHB analysis of government data. Homebuilders and remodelers have added more than 80,000 jobs over the last year and more than 700,000 positions since the low point of the recession. But they aren't finding new workers fast enough. "People need to be prepared -- if they need to rebuild a home, shopping mall, or whatever -- they need to be prepared for it to take a long time to get it done because there's a massive shortage of labor," said Steve Cvitanovic, a San Francisco-based attorney who co-chairs the construction law practice group at Haight Brown & Bonesteel. They also should prepare for higher prices: Cvitanovic expects construction costs to jump about 25 percent this year, but that figure could reach as high as 50 percent depending on the project and location. That's a big leap, he noted, even for an industry that has grown accustomed to annual cost increases of about 10 percent. The construction industry's labor shortage has its roots in the Great Recession, a devastating four-year period for the real estate sector that saw building projects dry up and tens of thousands of workers leave the industry for good. Meantime, an immigration crackdown has choked off an important supply of new labor, and young people are less likely to see value in construction careers as schools have deemphasized trades. "The construction industry is experiencing a worker shortage, which has many causes," Dietz said in an email. "These include large job losses experienced during and after the Great Recession, an aging labor force, a slowdown in immigration and generational change." Bottom line: It's an inopportune time for a big spike in construction demand brought on by hurricanes and wildfires. "Before these disasters there was a massive shortage of labor in the industry, and it was all over the place, in basically every sector," Cvitanovic told CBS MoneyWatch. "It's going to be really bad." Contractors have plenty of concerns, from regulation to the cost of materials to competition. But labor tops the list. Almost 70 percent of firms are struggling to fill "hourly craft positions that represent the bulk of the construction workforce," according to a survey by the Associated General Contractors of America. 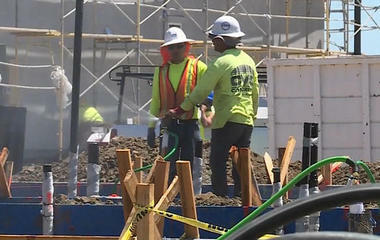 The construction business is back up and booming, but there is one thing missing -- workers. Among those surveyed, 75 percent expect hiring to stay just as bad or get worse in the next 12 months. Contractors in the South and Midwest are most worried. A tougher government stance on immigrant labor is a factor in the shortage of qualified workers, but Brian Binke, president and CEO of Detroit-based construction-industry recruiter The Birmingham Group, sees the U.S. education system as a more important culprit. Binke said a "higher-education or bust" mentality has soured many young people on potentially lucrative careers in construction. Tuition is often much cheaper at trade schools, which also churn out graduates quicker. "The middle-income jobs of the future are in skilled trades," said Binke, who noted he was forced to take shop class in school, working with both wood and metal. "I think the whole educational system is way behind in that." Meantime, the construction industry has aged, with the average employee about a decade older than those in the information-technology and marketing fields. So while construction companies cheered President Donald Trump's call for $1 trillion in new infrastructure spending, Binke said, "they don't have the labor to do it." That's a shame, he said, since traditional manufacturing has mostly moved overseas to low-cost labor markets and is unlikely to return to the US. "You can't build infrastructure -- roads, bridges, stadiums, hospitals, houses -- in China," Binke said. "These are jobs that have to be taken by Americans." A solution should include more outreach from companies to schools and more government support for training in construction trades, he said. Higher awareness of construction career opportunities could also help, said Cvitanovic, who noted that a twentysomething employee of a sporting-goods store making $12 an hour may not realize she could earn $40 per hour, plus fringe benefits, in construction. "It's mind-boggling to me that more kids don't know about it," he said. "I think a lot of it is a lack of awareness of the opportunity." Contractors are struggling to hire both skilled construction positions and general labor jobs that sometimes are filled by immigrant workers with authorization to work in the US, Cvitanovic said.